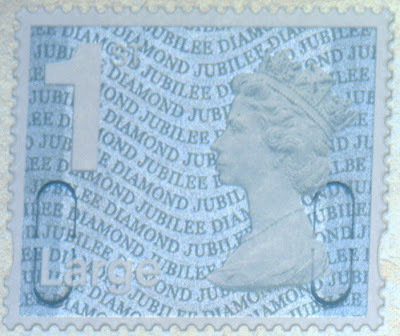 All Large Diamond Jubilee Machin Stamps now on sale at post offices. 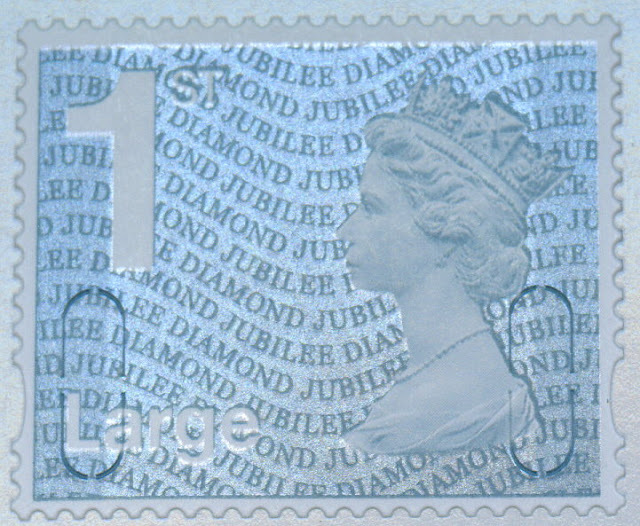 As mentioned in an earlier post, the counter sheet stamps were available in early March. The Business Sheet version was seen on eBay a week later. The last piece of the jigsaw, the retail booklet of 4 was on sale in Post Offices last week. This has the lettering [JUBI]LFE to the right of the Queen's head, with the usual 'F' for (book of) four. For the record, the counter sheet (LEE) and the Business Sheet (LBE) are shown below. We understand that stock of gold 1st Large stamps in all three formats are exhausted at PO Supplies Department, Swindon, which is why these have been distributed early. From the point of view of Post Office Ltd the issue date of these is still 27 March (so initial stocks of at least the counter sheets must have been sent to all branches for issue on Tuesday). However, as far as Royal Mail Tallents House is concerned, these stamps will be included in the presentation pack with airmail and make-up stamps for the (as yet unannounced) new tariff, and the jubilee stamps will not be issued/distributed until the new tariff stamps are distributed. This almost certainly means that Royal Mail standing order customers will receive first day covers dated at least 2 weeks after the last of the three Large Jubilee stamps has been issued by Post Office Ltd, and probably 4 weeks after the (unrecorded) first day of sale of the counter sheet. We understand that the official first day covers will bear all of the new stamps, which is something of a pity. The new airmail and any make-up stamps probably won't be sold early at Post Office branches, but the official FDCs will bear all of the stamps, new and somewhat 'old'. It would seem like a good time to prepare your own FDCs for the actual new stamps, and return the 'very-post-dated' standing order FDCs to Edinburgh for a refund! What do you think? 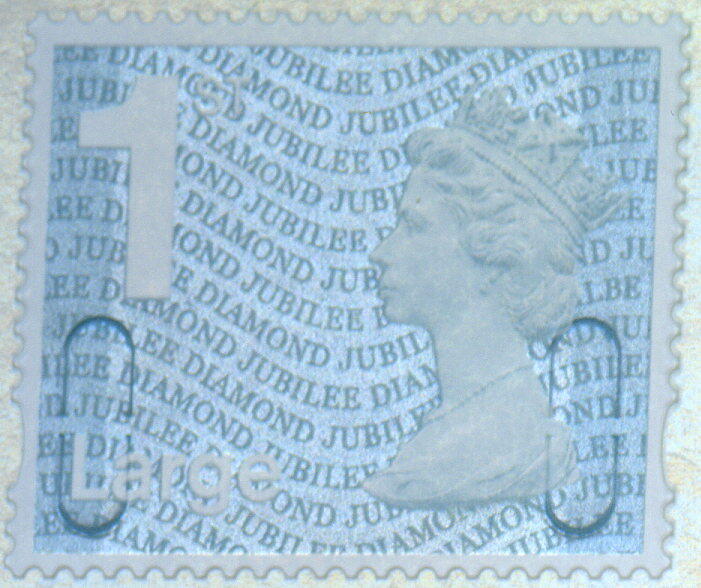 Is there any point in having a FDC for either 27 March or mid-April for these Large Jubilee stamps? Leave your comments, please! Just another nail in the coffin for FDC collectors. Official FDCs are becoming increasingly irrelevant world-wide. We need a grass-roots movement to convert collectors to postal history which carries a datestamp corresponding to FDI, and which has actually been sent through the post. Won't do much for the DJ issues, except for a very lucky few, but would surely bring back some interest in FDCs. Agreed. And doubtless the major cover producers will be producing some as well, as much higher prices than Royal Mail - we did for a while, but we got the dates right! Sadly with haphazard distribution by Post Office supplies there are no real FDs for these. So, having prepared several FDCs for the original Jubilee 1st Class definitive some time ago, and hoping to add the Large version to some of these to get some double dated FDCs, I am now unsure whether to go for it tomorrow (27 March) and "double date" or wait until Tallents House issue the Large versions on an FDC and double date for that date. I know stamps are sometimes available "early", but do we know whether 27 March will be the official "first day of issue" for the 1st Large Jubilee definitive? " Or is this the six million dollar unanswered question?!! I have a query in to PO Ltd to confirm that branches (all those not already selling!) will be selling at least the counter sheet tomorrow (27th). No answer yet. All this confusion could have easily been avoided if the 1st Class, 1 Class Large Letter, Large Letter Booklet of 4 and business sheet versions had all been released at the same time. Three of my local post offices are selling the large letter version, yet one isn't (but they have them) and are using the business sheet versions as they have none of the counter sheets left. 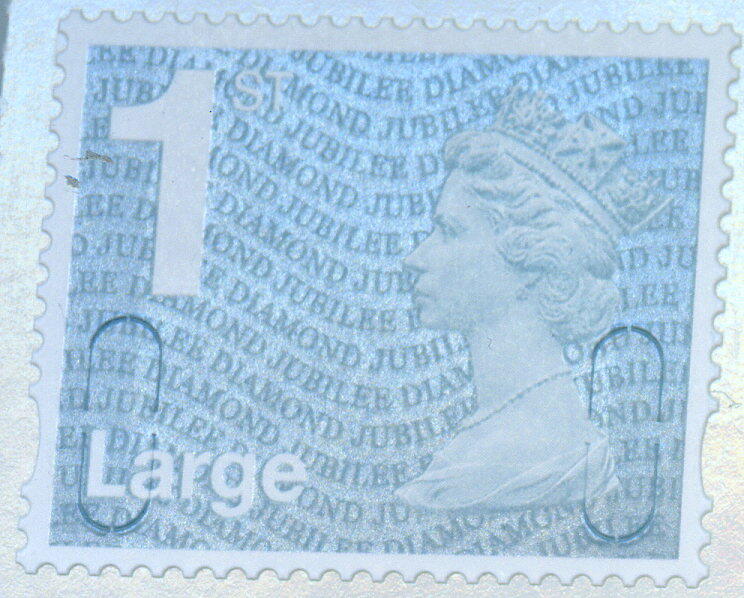 It’s doubt full if business or operational needs could justify the split issue dates, the answer, I suspect lies in an attempt to cut cost and reduce the number of stamps printed by using smaller more frequent print runs reducing the availability of printing time and other resources. This policy is all well and good as long as stock control & distribution are of a decent standard.